So Parallels fell off my radar, until a few days ago, when I was trying to find a way to run GuildWars on my Mac. Turns out, Parallels runs DirectX 9 and VirtualBox doesn’t. So, I downloaded the trial of Parallels, and it’s pretty cool. Unfortunately, no, it didn’t meet my needs for a gaming machine, although it’s possible it would do the job on a newer model Mac. (Aside from some weird texture issues, the only concern was framerate.) But I have switched my web testing over to Parallels, and I don’t think I’ll be looking back. 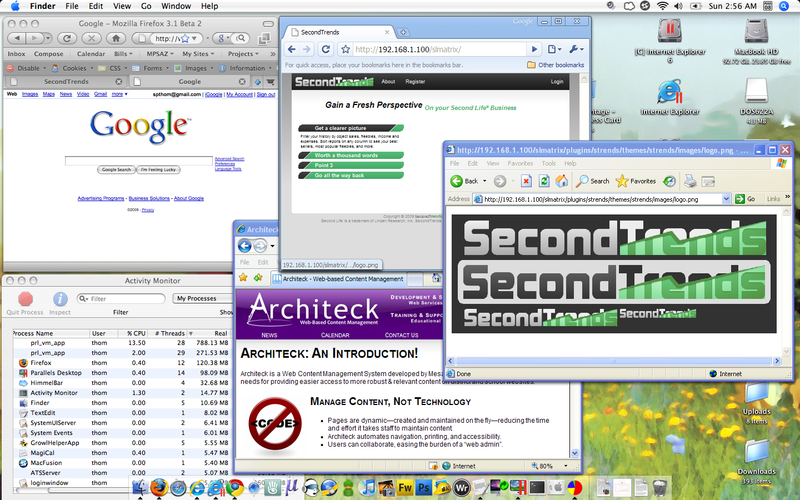 Parallels has gone far beyond window integration (which is itself much-improved) to nearly true application integration. I can set favorite Windows apps such as Internet Explorer (using the term “favorite” quite loosely) and they get saved to my dock. Later on, I can click on an icon to launch and/or focus the app, just as I can do with a native Mac app. I know I’m late to the game on this feature, but it’s such a relief for it to be automatic in Parallels… I spent hours trying to write an AppleScript to do the same thing in VirtualBox–the closest I got was to restore the virtual machine to a particular state and launch it. But under normal circumstances, it’s a cool experience. Ther XP windows–what with their drop shadows, their playing nice with Exposé, the lack of a taskbar–look so comfortable on my Mac desktop it’s a bit eerie… In fact, I tried the “silver” XP theme and, it was so incognito that I had to turn it back to the default blue in order to maintain sanity. So, Parallels is how I get my Windows now. Have you tried Virtualbox 2.1.4 with experimental 3D graphics acceleration? I am currently running 2.1.2, which according to the changelog, does have the 3D acceleration, but I have not tried using that feature. I have some upgrades coming for my computer (bigger hard drive, Leopard, and a new keyboard–don’t ask, haha) and I’ve decided I’m just going to go with Boot Camp and Parallels in concert. One of the other reasons I moved away from VirtualBox is their lack of ability to compress a disk image… They did have it available via command line, but disabled it a few versions ago. The result was that I was stuck with a bloated, 9 GB image file despite only having about 4 GB on the drive.